We woke up to a bright sunny morn this Sunday. This is the best thing that could have happened after three days of incessant rains. Slushy outside, damp and clammy inside. Everything soggy – from biscuits to mood. Too much of anything is not good. 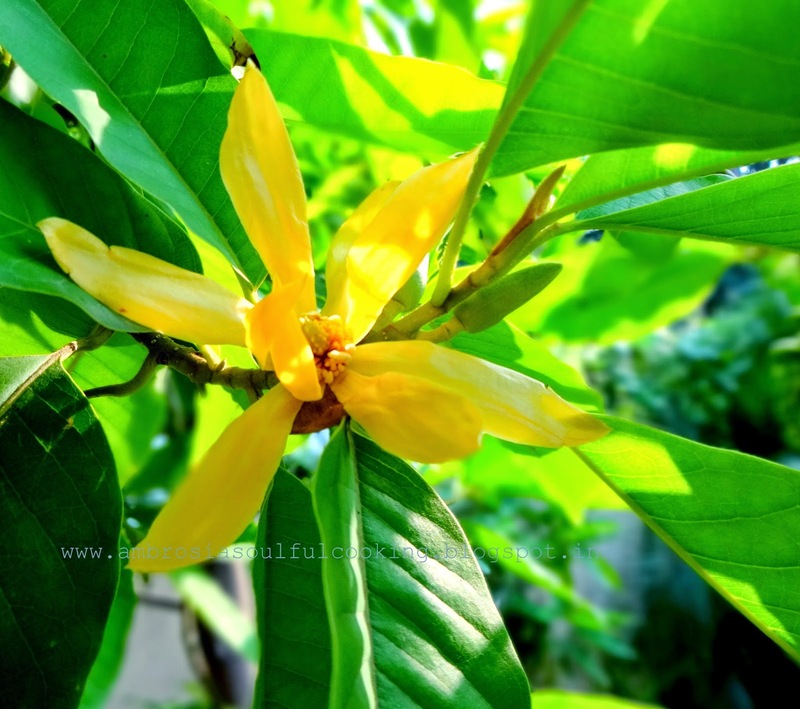 Buttery flowers of Golden Champa (Michelia Champaca) suffuse the morning air with the heavenly aroma. The tree is in full bloom. My son stops every time he passes underneath the tree pointing at the grape like fruits. His grapes are actually the fruits of Champa. 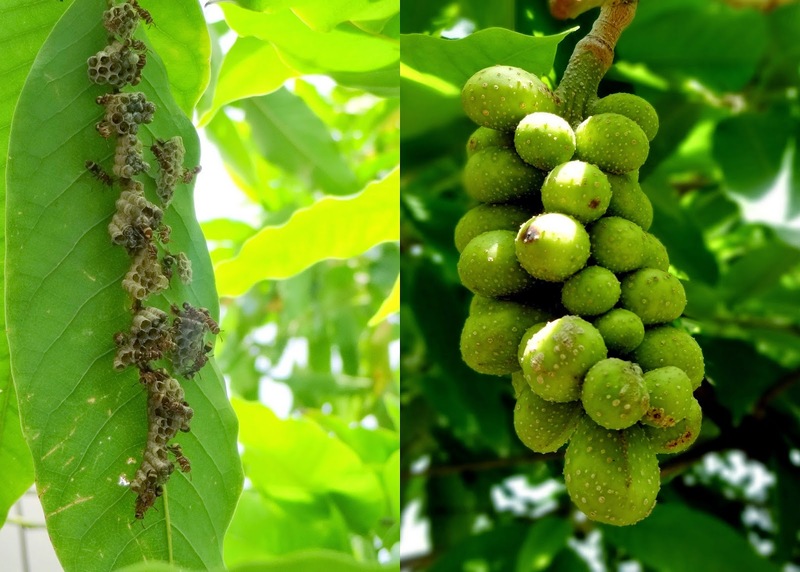 Wild bees have made home in the broad leaves of Champa. 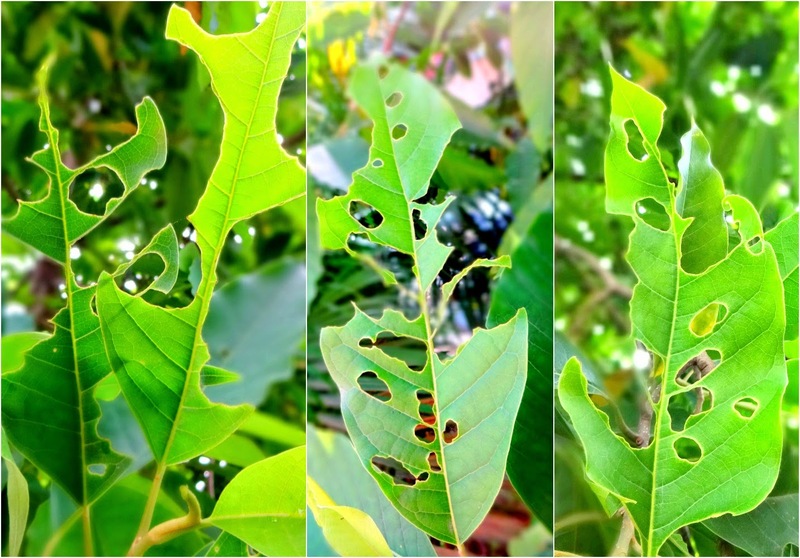 Some intricate cut work in the leaves indicate the presence of caterpillars that have been gorging on the juicy leaves on their journey to become a moth or a butterfly. We strain our eyes to spot one but in vain. They camouflaged beautifully and perhaps watching us from some corner. 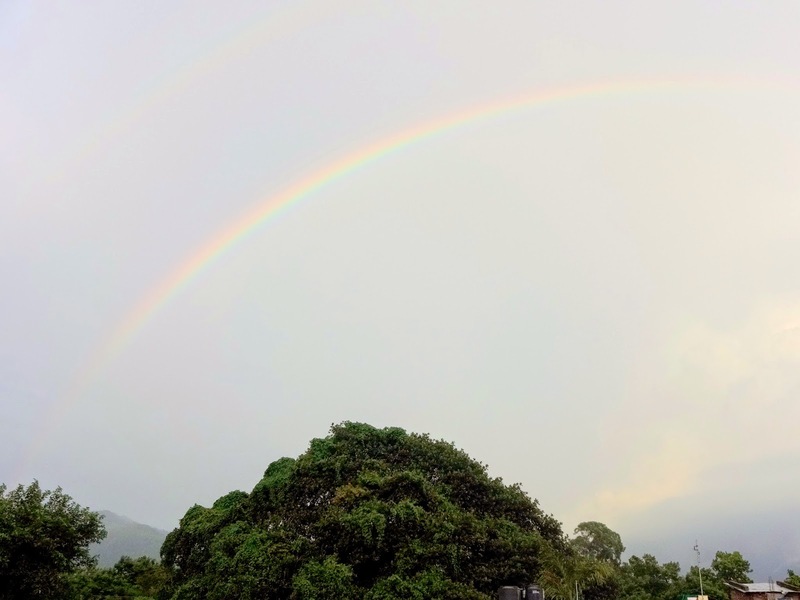 A rainbow stretched across the sky grows faint while the raindrops sitting on the leaves gleam as the rays of the Sun fall on them. Everything looks so fresh and lively. During monsoons, light meals suit the system. 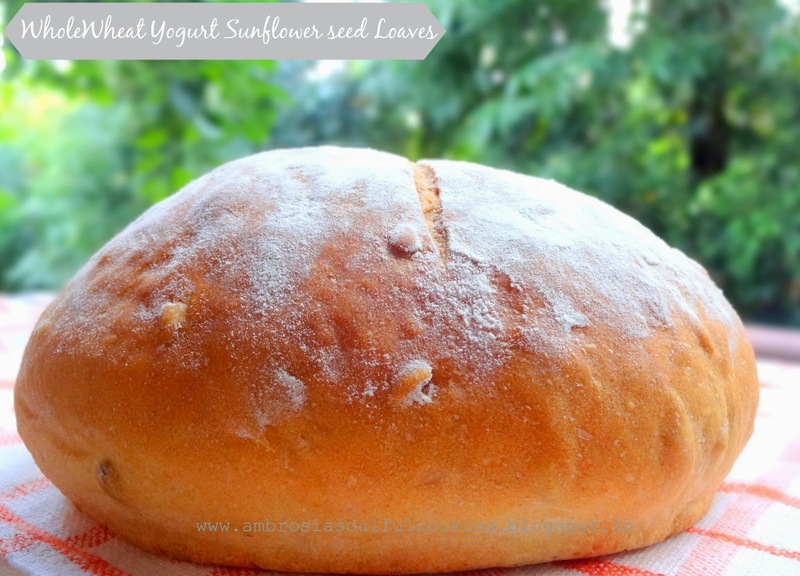 I made Whole Wheat Yogurt Sunflower seed bread to go with a simple veggie. 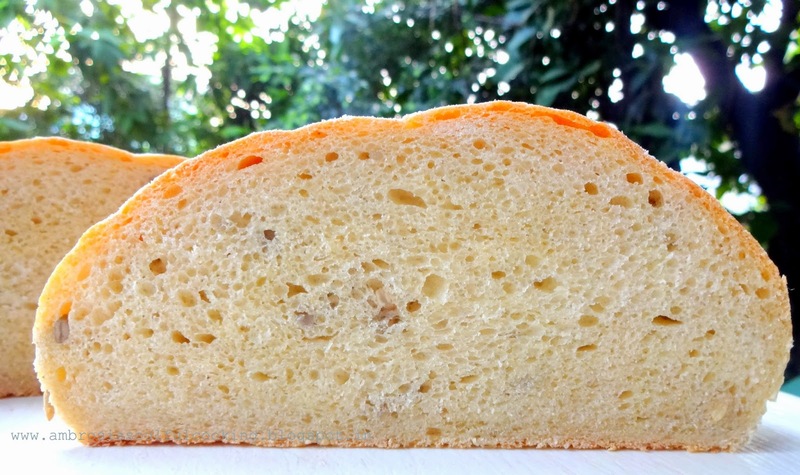 Yogurt makes bread soft and spongy. In a large bowl, dissolves sugar in half cup water and add yeast. Cover and keep for 15 minutes. Add whole wheat flour, salt, yogurt and oil and beat until smooth. Add all-purpose flour to get a firm dough. Turn onto a lightly floured counter and knead till the dough becomes smooth and elastic. This will take about 6 to 8 minutes. Add more warm water if required. Place the dough in an oiled bowl and turn once so that it is evenly coated with oil. Cover and let rise for one hour or until doubled. Punch dough down, turn onto a lightly floured surface. Stretch and sprinkle sunflower seeds. Turn and repeat. Cut it into two equal parts. Roll each part into a ball. 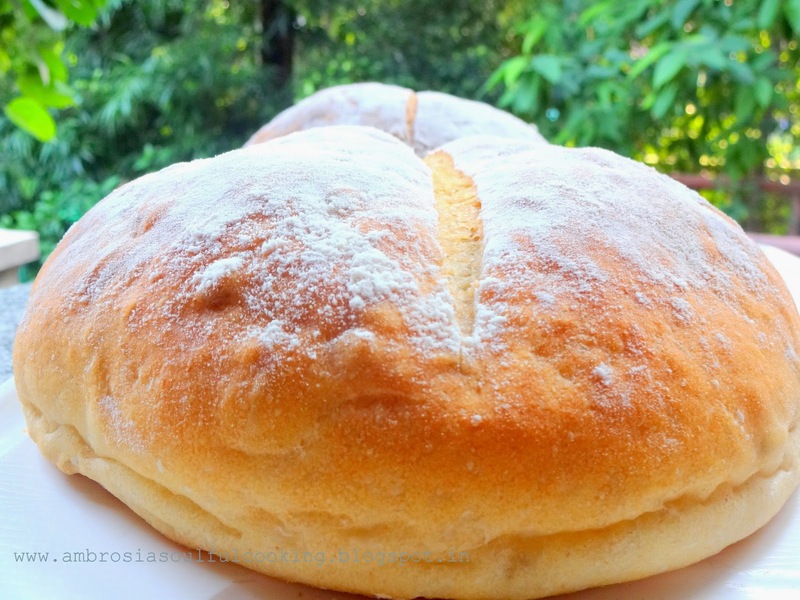 Roll it till smooth and then stretch and fold the top shaping dough into a boule. Transfer the boule onto a greased baking tray. Cover with a kitchen towel. Leave it to rise for 40 minutes. Sprinkle each boule with all-purpose flour. Make a diagonal slash about ¼ inch deep on the surface with a knife or a blade. Keep the blade at 45 degree angle to make slash. Bake immediately after slashing. Bake for 35 to 40 minutes or till the top turns golden and bottom sounds hollow when tapped. I followed this recipe and made a pefect loaf, add dry grapes instead of sunflower seeds. The bread is just out of oven, looks great. Thanks you very much and will try more. Hi! I am so hapy that you visited my blog and tried my recipe. I hope the bread tasted great. Adding dry grapes is a genius idea. I might also add to my bread next time when I bake. Thanks! Hello, that's a lovely pic of the rainbow! I tried this recipe with chickpea and whole wheat flour. Tasty n little bit dense, think the yoghurt made it soft. ☺️Added poppy seeds too. We had it with burgers for our dinner. Was experimenting with chickpea flour. Will try making completely with the wheat flour next time..
Hello Binu, I am very curious to know how chickpea flour tastes in bread. I have been thinking of using it since a long time. Thanks for your feedback.